Žganci is a dish in Slovenian and Croatian cuisine, known as Sterz in Austria, pura on the Croatian coast, and also known in northern Italy. It is a form of polenta prepared from various grains. 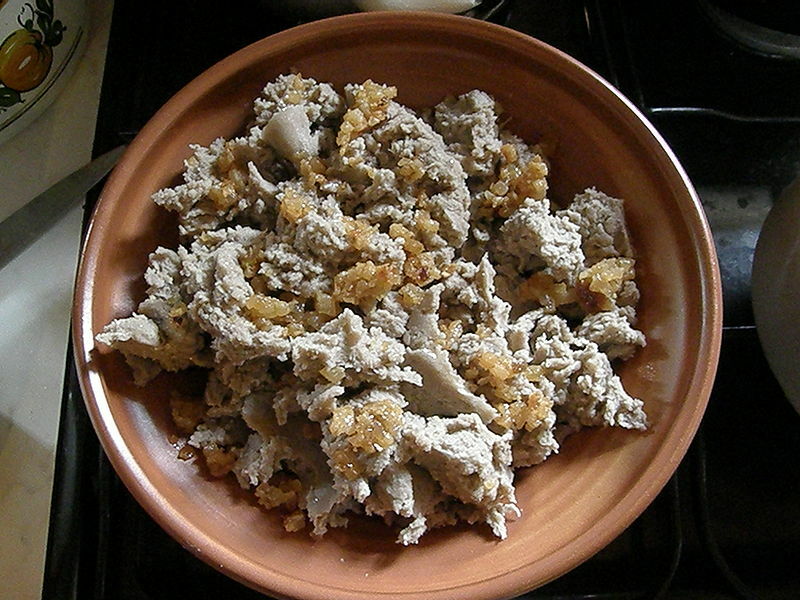 Left: Buckwheat žganci with cracklings. It is made from maize, wheat or buckwheat flour, water, cooking oil and salt, which is cooked for fifteen minutes on a low boil. The lump is then crumbled onto a plate for serving. Softer žganci is called Styrian style in Slovenia. Žganci can be served with milk, honey, cracklings, or runny yogurt. Žganci with cabbage or blood sausage is a traditional Slovenian breakfast dish. A savory version is served with meat as part of a main dish. Žganci was a typical everyday meal of the central and Alpine part of Slovenia. The oldest preparation method explains the word žganci. The word žganci is derived from the Slovenian verb žgati 'to burn, to toast'.